For the sauce, stir all sauce ingredients to a bowl andstir until well blended and smooth. 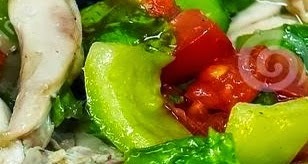 Thanks you have read the article about chicken salad vegetable recipe. If you want to duplicate this article you are expected to include links https://www.gaweenak.web.id/2014/10/chicken-salad-vegetable-recipe.html. Thank you for your attention.